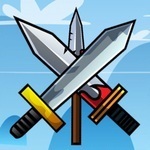 Medieval Quest: Knight Battle — iOS app Listed on Flippa: Medieval addictive game with 1200+ organic downloads in one month! Medieval addictive game with 1200+ organic downloads in one month! Highly downloaded medieval game built in Unity with more than 1200 organic downloads and excellent rating on both iOS and Google Play Store in only one month with high keyword rankings!